Off the coast of North America drifts a jellyfish that has unknowingly revolutionized molecular biology. 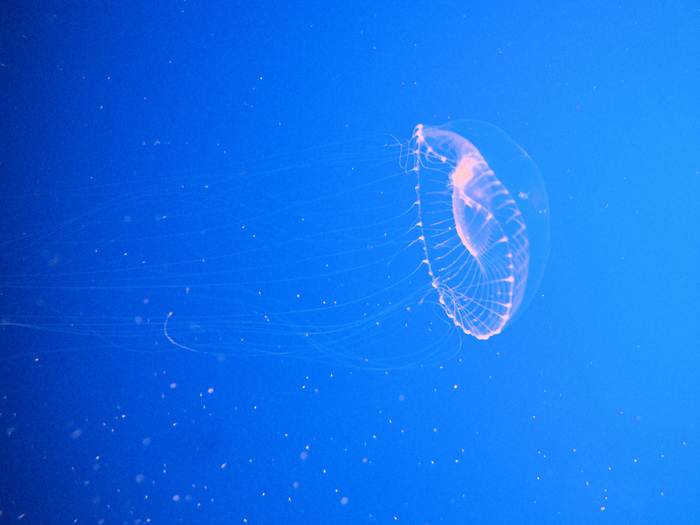 Aequorea victoria produces green fluorescent protein (GFP), a substance that adds a green tinge to the jelly’s bioluminescence, which can sometimes be seen around its margins. By inserting a slightly modified version of the GFP gene into the genomes of other organisms, researchers have visualized a stunning range of biological phenomena. But GFP isn’t without flaws. For some uses—for instance, tracking expression of some low-expression genes—the protein just isn’t bright enough. Luckily, A. victoria isn’t the only organism to produce a fluorescent protein amenable to laboratory use. The tiny European lancelet Branchiostoma lanceolatum, an invertebrate found in the northeastern Atlantic Ocean, produces a multimeric yellow fluorescent protein called LanYFP. Recently, Shaner et al. modified the protein to make it a green fluorescing monomer, making it a possible stand-in for GFP that could be used with the same microscope filters already used for GFP. Their new protein, dubbed mNeonGreen, isn’t just a new GFP substitute—it’s actually three times brighter than GFP in vitro. Although their results were a promising first step, Shaner et al. did not determine whether mNeonGreen’s better in vitro fluorescence actually makes a difference in vivo. In the January issue of G3, Hostettler et al. address that question by expressing the protein in Caenorhabditis elegans, a commonly used animal model with a transparent body that makes it particularly suitable for imaging studies. Their results show the green color produced by mNeonGreen is significantly brighter than GFP in C. elegans, allowing visualization of low-expression genes that can’t be seen using GFP. The group also found that mNeonGreen works well for GFP’s typical applications, from tagging proteins to labelling subcellular compartments, and that the protein is as stable against photodegradation as GFP. These properties will make mNeonGreen a valuable asset to researchers—and in light of this, Hostletter et al. have kindly provided a plasmid set containing the gene for use by researchers everywhere. Hostettler, L.; Grundy, L.; Käser-Pébernard, S.; Wicky, C.; Schafer, W.; Glauser, D. The Bright Fluorescent Protein mNeonGreen Facilitates Protein Expression Analysis In Vivo.